So, why have we decided to focus on these 5? We feel that this group gives a healthy mixture of usability and functionality. Yes, we know that some of these projects are not exactly live, but we still feel that the potential of the projects is enough to warrant a place on our list. We are going to go through each and every platform and then compare them at the end. Ethereum is, without a doubt, the big daddy of smart contract platforms. The main man behind Ethereum is Vitalik Buterin. Buterin was fascinated with Bitcoin, but he realized that the blockchain technology had far more use than being a mere facilitator of a payment protocol. He realized that one can use the blockchain technology to create decentralized applications. That was when he was inspired to create Ethereum. Ethereum, like Bitcoin, was a cryptocurrency, however, that’s where the similarity ends. Because while Bitcoin is a “first-generation” blockchain, Ethereum broke the mold by becoming the first ever second-generation blockchain. Ethereum revolutionized the crypto-space by bringing in smart contracts on the blockchain. Smart contracts were first conceptualized by Nick Szabo. The idea is simple, have a set of self-executing instructions between two parties which don’t need to be supervised or enforced by a third-party. The idea seems pretty straightforward, right? However, smart contracts enabled Ethereum to create an environment wherein developers from around the world could create their own decentralized application aka Dapps. Sounds pretty awesome right? So, how exactly can you build them? You need to code smart contracts using solidity. A program is deterministic if it gives the same output to a given input every single time. Eg. If 3+1 = 4 then 3+1 will ALWAYS be 4 (assuming the same base). So when a program gives the same output to the same set of inputs in different computers, the program is called deterministic. The environment must make sure that execution of the smart contract is always deterministic. This is obviously a problem with smart contracts because, contracts by definition, must be capable of termination in a given time limit. So the environment must be able to halt the operation of the smart contract. If the contract is not isolated, this may hamper the whole system. Hence, it is critical for a contract to be kept isolated in a sandbox to save the entire environment from any negative effects. Ethereum executes its smart contracts using a virtual machine called Ethereum Virtual Machine (EVM). The next core Ethereum concept that one must understand is gas. Remember the “Terminable” property of smart contract environments? Well, Ethereum smart contract achieves this property by utilizing gas. Each and every line that is coded in the smart contract requires a certain amount of gas to execute. So, when a developer submits a smart contract for execution, they also specify the maximum gas limit. Think of the gas limit as the fuel you fill up in your car before going for a drive, the moment the fuel runs out, the car stops working. Each and every line in the smart contract requires a certain amount of gas to execute. Once the gas runs out, the smart contract stops executing. We have covered this topic at length before so we will just go over this very briefly. One of the most alluring features of Ethereum is initial coin offering or ICOs. Developers around the world can use Ethereum’s virtual machine to power their smart contracts and use the platform to raise lots of money in a crowded sale with relative ease. Because of this very feature, Ethereum’s adoption has gone through the roof. Ethereum as of right now is using the Proof-of-Work mining, i.e. the same mining process used by Bitcoin. Basically, miners compete to find the next block in the chain by using their processing power to solve complex cryptographic puzzles. Ethereum is eventually going to move on to Proof-of-Stake by utilizing the Casper protocol. POS is far more environmentally friendly than POW and is a lot more scalable. 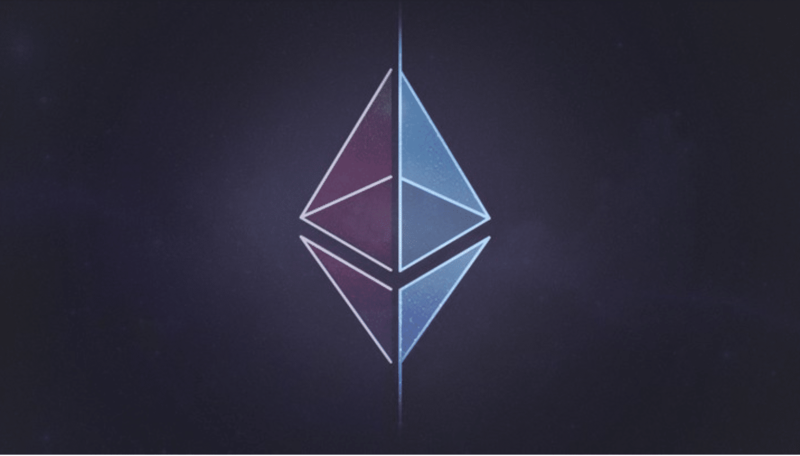 There is no doubt of the impact that Ethereum has had on the crypto-space, however, there are some major problems surrounding its performance. As of right now, Ethereum fails when it comes to scalability. They can only manage 25 transactions per second, which is not ideal for Dapps who want mainstream adoption. On top of that, Ethereum can be expensive for developers. The gas prices for the execution of Dapps can go through the roof. Along with these, there is one more problem that affects Ethereum and other cryptocurrencies. This problem is interoperability. As of right now, if Alice owns Bitcoin and Bob owns Ethereum, then there is no easy and direct way for the two to interact with each other. This is a really big issue because in the future, there may be thousands of blockchains running in parallel and there should be a way for them to interact seamlessly with each other. One project that is aiming to solve this interoperability problem is Cosmos. Cosmos aims to become an “internet of blockchains” which is going to solve these problems once and for all. Cosmos’s architecture consists of several independent blockchains called “Zones” attached to a central blockchain called “Hub”. The brains behind this project are CEO Jae Kwon and CTO Ethan Buchman and the Interchain Foundation team. Tendermint is a variant of PBFT i.e. Practical Byzantine Fault Tolerance. A Byzantine Fault Tolerance, or BFT, the system is a system which has successfully answered the Byzantine Generals Problem. We have covered the Byzantine Generals Problem in detail here. To keep things short, for a decentralized peer-to-peer system to function in a trustless manner, it is imperative for them to find the solution to the Byzantine’s Generals Problem. 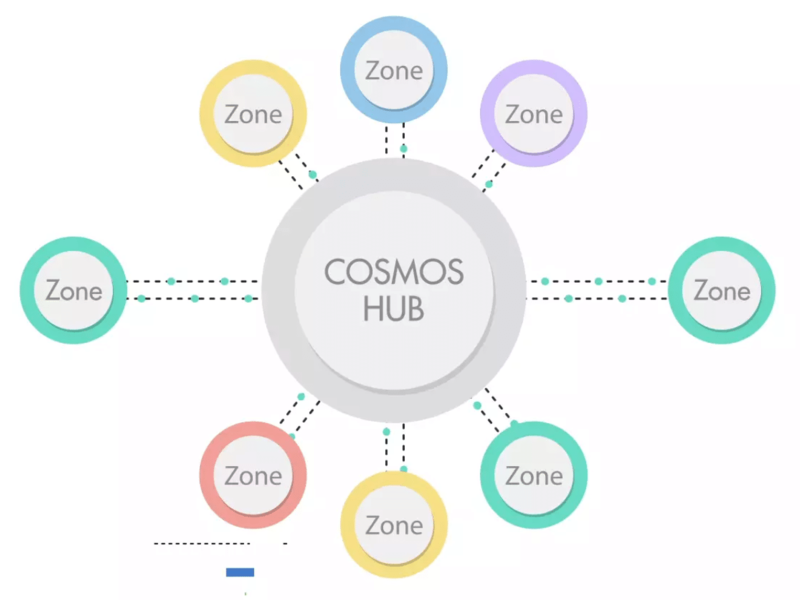 As we have mentioned before, Cosmos’s architecture will follow the Hub and Zones method. There will be multiple parallel blockchains connected to one central Hub blockchain. Think of the Sun and the solar system. This is a very simplified version of how two Zones communicate with each other via IBC. DEX: Since Cosmos is linking so many blockchains with each other, it goes without saying that it can easily enable different ecosystems to interact with one another. This a perfect setting for a decentralized exchange. The brainchild of Ethereum co-founder Charles Hoskinson, Cardano is a smart contract platform however, Cardano offers scalability and security through layered architecture. Cardano’s approach is unique in the space itself since it is built on scientific philosophy and peer-reviewed academic research. 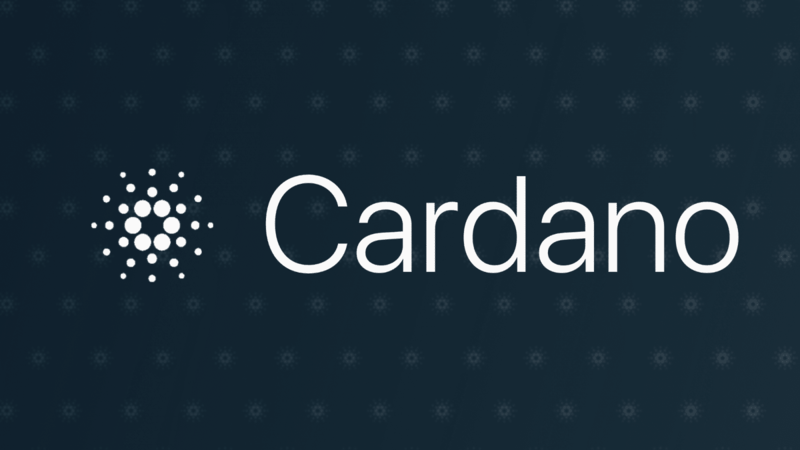 These three organizations work in synergy to make sure that Cardano development is going on at a good pace. 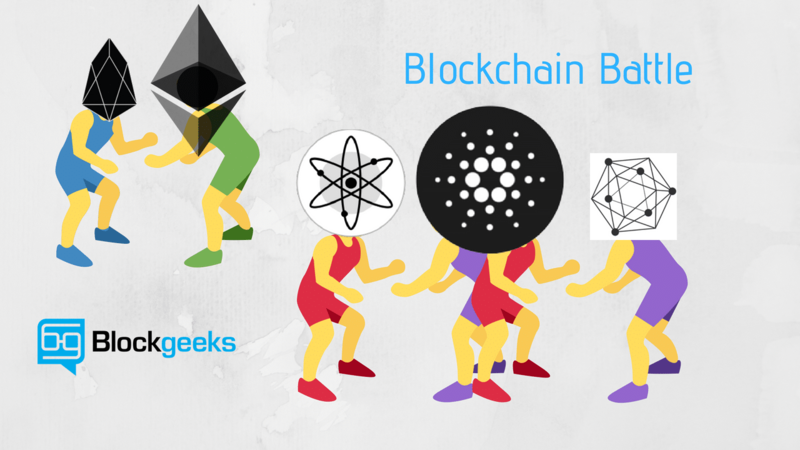 There is one really interesting quality that makes Cardano unique as compared to the other smart contract platforms. Majority of the other smart contract platforms are coded via imperial programming language. Cardano uses Haskell for its source code, which is a functional programming language. For its smart contracts, Cardano uses Plutus, which is also a functional language. Let us explain the difference between the two types of languages in a straightforward way. As you can see, it takes a lot of steps. Now, how will that work in a functional language? This makes the functional approach easier to reason mathematically. Functional languages helps with scalability and it also helps in making the program far more precise. Cardano uses a new proof of stake algorithm called Ouroboros, which determines how individual nodes reach consensus about the network. The protocol has been designed by a team led by OHK Chief Scientist, Professor Aggelos Kiayias. Ouroboros is the first proof of stake protocol that has mathematically been shown to be provably secure, and the first to have gone through peer review through its acceptance to Crypto 2017, the leading cryptography conference. The way Cardano plans to execute interoperability is by implementing sidechains. Sidechain as a concept has been in the crypto circles for quite some time now. The idea is very straightforward; you have a parallel chain which runs along with the main chain. The side chain will be attached to the main chain via a two-way peg. Cardano will support sidechains based on the research by Kiayias, Miller, and Zindros (KMZ) involving “non-interactive proofs of proofs of work”. Getting a compressed version of a blockchain. EOS are aiming to become a decentralized operating system which can support industrial-scale decentralized applications. 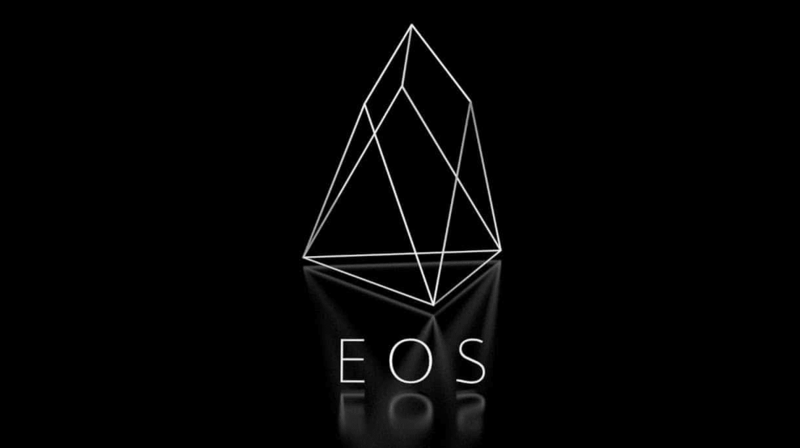 The driving force behind EOS is Dan Larimer (the creator of BitShares and Steemit) and Block.One. EOS recently came into the spotlight for their year-long ICO which raised a record-breaking $4 billion. EOS achieves its scalability via the utilization of the delegated proof-of-stake (DPOS) consensus mechanism, which is a variation of the traditional proof-of-stake. It can theoretically do millions of transactions per second. So, how is DPOS different from traditional POS? While in POS the entire network will have to take care of the consensus, in DPOS all the EOS holders will elect 21 block producers who will be in charge of taking care of the consensus and general network health. Anyone can participate in the block producer election and they will be given an opportunity to produce blocks proportional to the total votes they receive relative to all other producers. 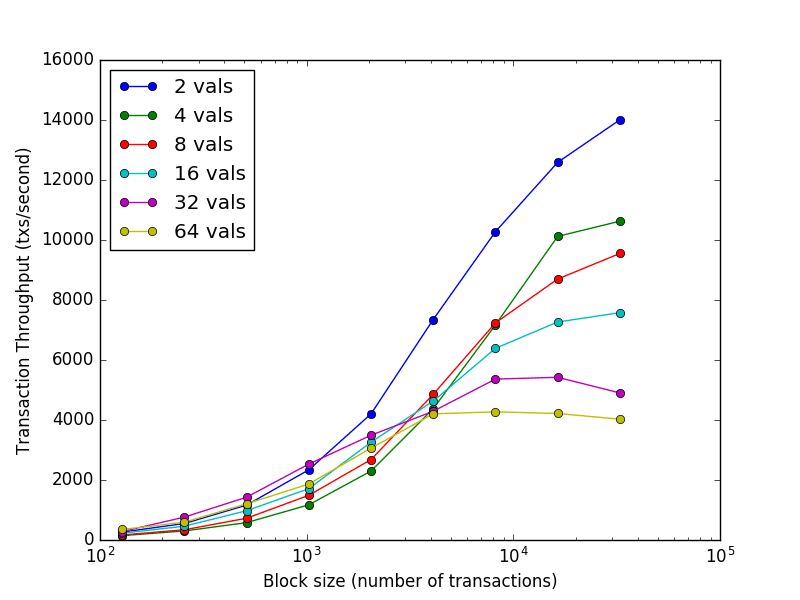 As you can imagine, the importance of these block producers definitely can’t be underestimated. Not only do they take care of consensus, but they take care of overall network health as well. This is why it is extremely important that each and every single vote that has been cast has proper weightage. This is why, Larimer introduced the idea of Voter Decay, which will reduce the weightage of old votes over time. The only way that one can maintain the strength of votes is by regular voting. Firstly, as we have seen time and again, elected officials may become corrupt and change their tune after getting elected. The vote decay system gives the voters a chance to reconsider their vote every week. This keeps the block producers accountable and on their toes. Secondly, people simply change over time. Maybe the political beliefs and ideologies that someone has today is completely different than what they had a year ago. The vote decay system will allow people to vote for someone who is more congruent with their newly evolved ideologies. This has the potential to be a truly revolutionary concept and can change decentralized voting (maybe even voting) forever. EOS works on an ownership model where users own and are entitled to use resources proportional to their stake, rather than having to pay for every transaction. So, in essence, if you hold N tokens of EOS then you are entitled to N*k transactions. This, in essence, eliminates transaction fees. EOS tokens, along with payment coins, can also be used as a toll to get all these resources. Platforms like Ethereum, EOS etc. are all public blockchains, meaning, anyone can choose to join the network. However, for big enterprises who need their own blockchain infrastructure, this is highly undesirable. Think of a blockchain conglomerate of banks. Banks need to deal with sensitive data every single day. From their internal transactional records to KYC data, there are lots of items which they simply can’t reveal to the public. Plus, only banks that have been vetted by the other banks present in the network should be allowed inside the network. Also, as we have already covered before, public blockchains are slow and have performance issues, which is again a big no-no for large-scale companies. 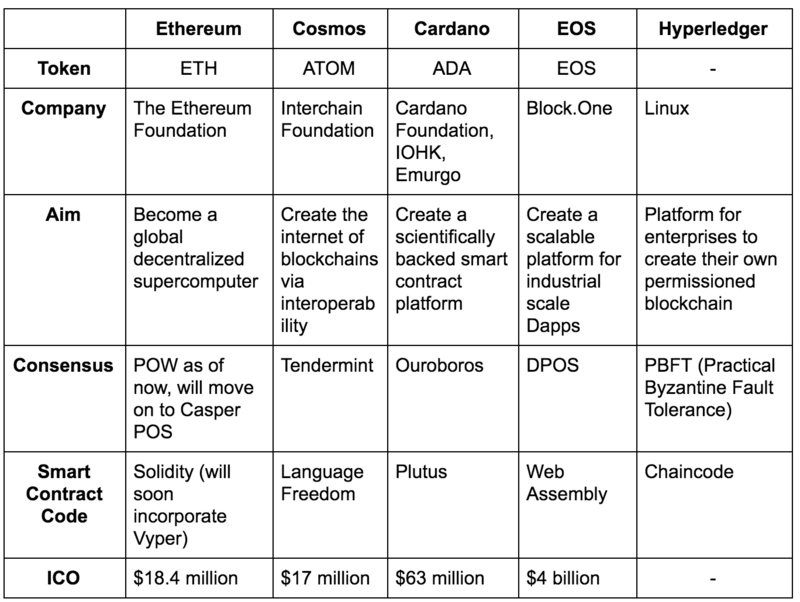 Hyperledger allows these companies to create their own high-performance permissioned blockchain (aka blockchains where each and every node must be vetted properly before entering). Iroha: Asn easy-to-use blockchain framework developed by a couple of Japanese companies. Burrow: Creates a permissible smart contract machine along the specification of Ethereum. Alright, so now that we have somewhat familiarized ourselves with these platforms, let’s compare all of them.